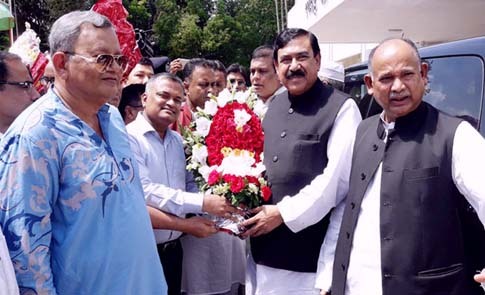 Shipping Minister Shajahan Khan on Friday described this year’s general election as a challenge for the country as all unitedly have to resist Jamaat-Shibir, Razakars, Al-badrs and BNP in the upcoming election. “Despite shouting of BNP-Jamat clique and anti-liberation forces, people of the country will finally vote for Awami League (AL) in the next general election,” he said. The minister was exchanging views with local leaders of AL, Bangladesh JASOD, Freedom Fighters, businessmen, workers’ leaders and journalists at Panchagarh Circuit House auditorium. Shajahan Khan questioned about identities of those who were trying to create unstable situation in the country in the name of students’ movement. The minister said that the next general election would be held at the right time in line with the Constitution. Shajahan Khan said there is no chance of discussion on the next election with BNP as it favours the anti-liberation forces. Nazmul Haque Prodhan, MP, Nurul Islam Sujon, MP, Chairman of Bangladesh Port Authority Tapan Kumar Chakraborty, Deputy Commissioner of Panchagarh Mohammad Zahirul Islam, Police Super Gias Uddin Ahmed and district AL General Secretary Anwar Sadat Samrat were present. In the afternoon, the minister visited the Banglabandha Land Port and addressed a public rally organised by Panchagarh district AL at Sher-e-Bangla Park.